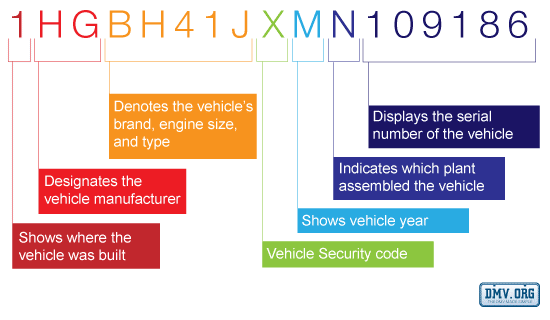 Assigned by automakers, a vehicle identification number (VIN) is a combination of 17 characters (numbers and letters) assigned to a car or truck during production. Like a Social Security number for your car, a vehicle's VIN number provides important information, such as the location of its original build and the type of engine. As of 1981 all vehicles have a VIN with 17 characters. Beneath the windshield on the driver's side of the vehicle. In the engine bay on the firewall. On a sticker or metal plate on the driver's side doorjamb. If you are still unable to locate your VIN number, there are other locations on the interior and exterior of a vehicle that you should be able to locate. A vehicle identification number check is commonly used by law enforcement to identify vehicle theft or fraud. For consumers, a VIN check helps reveal additional information on a vehicle's history when you're shopping for a used car. This is also referred to as a vehicle history report. The number of owners a vehicle has had. Odometer readings and rollback alerts. Liens placed on a vehicle. Title and accident history, such as flooded or salvaged titles. This information found on a VIN number lookup can be used to determine if you a purchasing vehicle from an honest seller and if a used car is worth the listing price. One way that dishonest or unethical sellers can get around information provided by a VIN check or VIN lookup is to alter a vehicle's VIN number. The most common method is through VIN cloning, which involves taking license plates or VIN numbers from registered vehicles and placing them on stolen property. The stolen VINs can be used to change or forge title documents and alter the car's actual history before sale. Buying from a dealership with a good reputation. Checking the VINs on the car to make sure each number matches the vehicle title. Making sure to examine each VIN carefully for signs of tampering. Getting a vehicle history report, which provides clone alerts for suspect vehicles.